Discussion in 'Off Topic' started by SPM, Feb 12, 2019. OK, so I'm sitting at Crafty Burger here in Denver for lunch.....and ESPN is on one of the TVs. I just don't get it. I mean, I know, I know...."Spooorrrrttttssss!" But it's not the game that's on - it's not the thrill of competition or people pitting their skills and stamina against one another. It's stats dweebs on the 10th iteration of a SportsCenter clone show opining about "Spooorrrrttttssss!" Mikail, WadeWatts, Flashpoint and 8 others like this. On this one thing you and I can agree. They're betting on when Joe Buck is going to jump Troy Aikman. I don't understand why people can't go out to eat or have a drink without staring at a TV. WadeWatts, premise, ChickenHawk and 9 others like this. 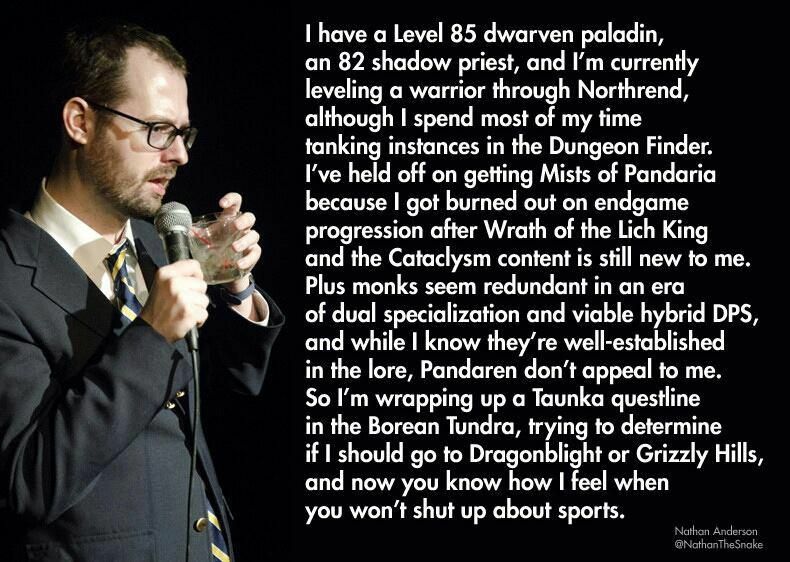 Its just Dungeons & Dragons for jock wannabes. NKD, premise, Pink_Vapor and 5 others like this. Darkhorse, BatteryOaksBilly, spittinfire and 4 others like this. Can you imagine what this country would be like if people knew as much about our constitution and history as they do "muh sportsball"? Darkhorse, Flashpoint, premise and 8 others like this. Fair enough. I'm out on my own and was waiting for the food....and didn't have a book. Whenever I have a hot toddy in front of me I'm into that not my phone or TV. Been a LONG time since I had one of those in front of me. Not the drink. That wasn't directed at you, kind of a general statement. I kinda figured you were alone and I fault noone sitting by themselves for looking at the tv or phone. The ones I detest are the ones doing it and constantly yelling at their kids to shush. Or, even worse, giving the kid the phone to keep em quiet. We used to play I spy a lot when the kids were younger. I've had several people comment on that over the years and even had our meals paid for a couple of times. Now, we try to talk about whatever subject they are currently on in school or some current event or proper table manners. Darkhorse, gsimmons, Slosolo2 and 1 other person like this. NKD and SPM like this. I'm with you there. Only thing worse than watching someone else play sports on TV, is watching someone talk about watching someone else play sports on TV. Now playing sports is fun/good for you. premise and SPM like this. Worst gift I ever gave was to my soon-to-be ex-wife - an Apple Watch. Constantly and on it - dinner, daughter's Kung fu practice, all.......the.......time. It's unreal (and it's amazing how secretive you think you can be with one). I'm already on my cell more than I should be anyways (like almost everyone in their 30s and below). I don't intend to get into the world of wearable smart tech. Flashpoint, spittinfire and draco88 like this. I wasn't directing that at you, either. It seems that every place to sit down and eat has at least one TV going. BatteryOaksBilly and SPM like this. If people would only get as excited about freedom. Oneofsix, smithnwesley, Long_Hunter and 3 others like this. jeepers it's entertainment. The same way that lifetime network is all about abused women it's just what people like watching at times. It's simply an escape from their reality. Too many escapes, people have no true reality anymore. premise, Scott88 and Long_Hunter like this. Maybe we should shut this site down too? After all this is just another escape right. HMP, SPST and B00ger like this. I would put forth the premise that here, in our virtual hangout, many of the discussions are indeed a hard dose of reality. Scott88, Long_Hunter and SPM like this. But still an escape from our actual lives otherwise we would be laying in the floor with rugrats or undoing someone in a basement. It just an escape I enjoy sports as well but none of it takes over for me. Yeah, lets do the one about what three guns we will carry in the Zombie Apocalypse again! I personally am not as annoyed by tech as most people get. Every single generation has complained about the tech of the next generation "ruining things". At one point in time, someone listened to Mozart and complained about the newfangled music the kids these days are listening to. And then printed news papers came out and people spent all evening looking at the paper. Then the evil radio, rotting kids brains as they sat around and listened to the Lone Ranger as opposed to playing outside. And then the idiot box of TV, and kids wasting away days watching Laverne and Shirley. Then came video games, the internet, cell phones, smart phones, virtual reality! Some things technology brings is moronic, but generally speaking, people can tend to be morons. But if used properly, then a smart phone is an amazing tool. I don't spend all my time on it playing games or taking selfies. I use it reading articles from around the world, watching how-to videos on all sorts of amazing crafts and skills that I don't have access to, and sharing ideas and discussions with both like minded, and alternate view people. Just like any tool, if abused then the interwebz can be a terrible thing, but used properly it is a great tool. I have the wealth of knowledge of all of the great writers from antiquity to now right in the palm of my hand. If I use that for stupid reasons, then that's on me, not the tool. Heck, consider how many of us here would have never met, networked, become friends, or anything without at some point without the net and spending time staring at a screen or a phone. backwoodsshooter, Matt.Cross, ChickenHawk and 1 other person like this. I actually consider it a truer form of reality. There is little difference it's still an escape. Only at other peoples houses. I used to always keep a bin full of magazines in the bathrooms in my homes. Can't pin down what year that stopped, probably 2010.
fishgutzy and SPM like this. We do not take phones into restaurants. Or movies. I catch de ball, I hit de ball, I tho de ball in de basket. Makes me wanna puke. Everytime one of these "sports" hounds around here get cranked up it's usually about USC or Clemmons. I always ask if they know what county the school is in??? Usually gets quiet again. FredB and SPM like this. You guys all thinking about golf or bowling, I’m having a hard time following. Oh, and there is no reality in this place. NCLivingBrit, JimP42, Railsplitter and 4 others like this. NKD, SPM, Pink_Vapor and 1 other person like this. Entertainment may be entertainment, but I think it can be argued some entertainment is more beneficial than others. I don't get it either, but kinda stopped caring. It used to really piss me off. I think nowadays I'm only annoyed if the sports fanatic is also a waste of a human being. If you're a productive and successful person, then hey, enjoy your fun. NKD, spittinfire, premise and 2 others like this. Now a days I’m usually reading or listening to a book on my phone. No shame in my game. Like the Harley guys say, "If I have to explain, you wouldn't understand." Personally, I never understood the folks that would rather read a book than go outside and do something. Are you alone or doing it with your friends/kids at the table? People trying to learn something and educate themselves are so dang stupid. They should go outside and do something. Anything. Maybe play some sports. I'll never forget, one evening at the Tryon House Family Restaurant... A family of 4 come in, father, mother, daughter and son. They sit in 2 booths. Parents in one, kids in another. And the whole time, they are all face down into electronic devices. They barely looked up to order. I wanted to take a photo, but couldn't figure out how to do it covertly. Sometimes a family meal is one of the only times you can get the whole family together at one time. The time should be shared with each other.